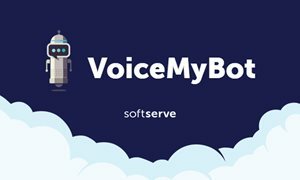 SoftServe’s VoiceMyBot Alexa skill is an innovative chatbot with a voice interface enabling access to all Atlassian HipChat Marketplace listings from a single place, using just voice commands and no code integrations. Digital software development and consulting provider SoftServe has recently developed the Alexa skill, VoiceMyBot, an innovative chatbot that goes far beyond the usual popular features of chatbots like file and screen sharing, video calling, and team chats. With the VoiceMyBot skill, Alexa users can easily talk to their Atlassian HipChat bots. Unlike other personal assistant apps, the VoiceMyBot skill allows users to configure the type of information/updates they would like to receive, from any extension, without additional integration. And as its open source, custom integrations can also be added. explains Michael Verlanov, SoftServe Product Manager and one of the project’s creators. Development teams often use Atlassian’s HipChat to communicate, so enabling users to interact with devices in a more intuitive way allows a variety of tasks to be performed much quicker and easier. Hands-free convenience with voice control. Access to all of Atlassian HipChat Marketplace listings from a single place, by using voice commands, without any code integrations. Opportunity to add custom integrations. Custom configuration of information/updates received, without additional integration. said Steve Goldsmith, general manager of HipChat. To learn more about the VoiceMyBot skill, read our blog, enable VoiceMyBot and download step-by-step installation and configuration instructions. With over 20 years of experience in digital software development and consulting, SoftServe is a global leader in solving complex business problems, creating industry disrupting technology and accelerating growth and innovation while optimizing operational efficiency. From leading ISV to Fortune 1000 digital enterprises, SoftServe has transformed the way thousands of clients do business with the most innovative technologies and processes in Big Data, Internet of Things (IoT), DevOps, digital commerce, security, and experience design.